Place chips in a resealable plastic bag and crush using a rolling pin. To make condiments, combine ketchup with sriracha and half the honey. Combine mustards with the remaining honey and a pinch of jalapeno powder. Place in refrigerator until ready to use. Grill or cook sausages or hot dogs and toast buns. Coat one side of bun with ketchup mixture and the other with mustard mixture. 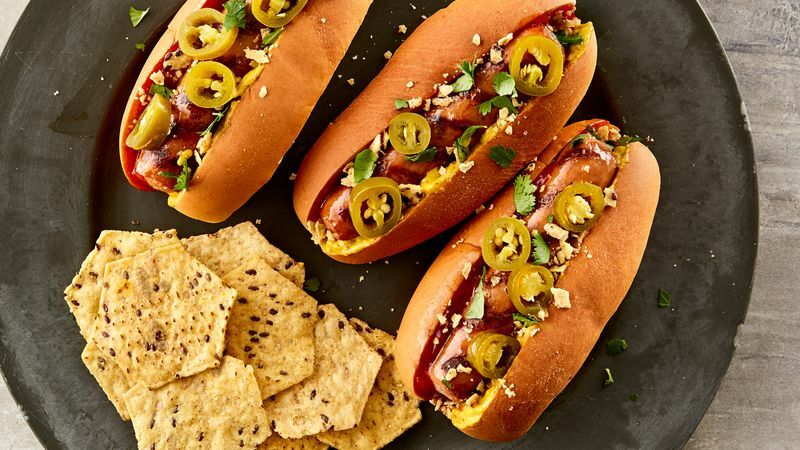 Place cooked sausage or hot dog on bun and top with crushed chips and additional condiments, if desired. Finally, top with cilantro and pickled jalapenos. Rinse out empty condiment squeeze bottles to use for your homemade condiments!